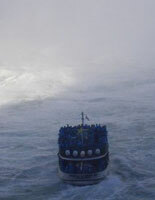 Tours each morning and mid afternoon. This 4-hour tour will take you to view or visit all of the following breathtaking sights in Niagara Falls, NY. On this tour, you will see Niagara Falls from all angles. On top from Prospect Observatory, in front with a view from the Maid of the Mist gorge cruise, and behind the falls with a walking adventure through the Cave of the Winds, where you will descend into the Niagara Gorge at the base of the Bridal Veil Falls. The daring among you will journey to the last point of the decks and walkways to experience the power of the falls on the Hurricane Deck. Then it's off to the NYS Observation Tower allowing a panoramic view of all three falls and the gorge below. A thrilling ride aboard the world-famous Maid of the Mist to ferry to the base of the magnificent Horseshoe Falls, a ride of a lifetime. 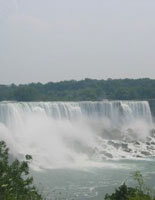 These tours have many stops that allow you to get dramatic photos of multiple views of Niagara Falls. Your are encouraged to bring your camera or camcorder along to capture your adventure! 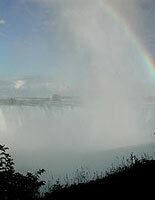 The Maid in America Tour offers you the best sightseeing tour of Niagara Falls. Make your reservations today, get your eTickets and relax in comfort and style. Leave your car at your hotel and skip the driving, stress. parking and crowds. Your driver/guide will be an experienced, licensed guide, who will be with you every step of the way to explain all the points of interest and to answer your questions. Tour does not cross the Canadian Boarder and documentation is not needed. Operates daily from May 15 - October 31 at 10am and 2pm. Times vary depending on season. Call Customer Service (details will be on your eTicket) for hotel pick up times and locations. 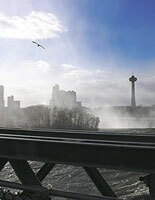 Departs daily from most major hotels in Niagara Falls, NY. Reservations are required at least 3 days in advance of desired tour. Customers are required to call Customer Service no less than 24 hours in advance of their tour to confirm their reservations and departure time and location (the number will be on your eTicket). This tour does not cross the Canadian Boarder and documentation is not needed. Your tour price includes ALL attractions and parking fees. You may want to bring some spending money or a credit card with you on your tour as you will be given the opportunity to purchase snacks or souvenirs. Tipping your tour guide is at your discretion. Comfortable walking shoes or sneakers are recommended. It is always a few degrees cooler near the water; a jacket or sweater is a good idea for cooler days.